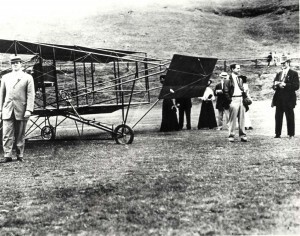 The Curtiss agent proceeded with arrangements for the entourage’s arrival and the exhibition flights. During an interview, Hall explained that his Curtiss flying machine was a speedster, requiring 35 miles per hour to stay off the ground, while the competitive Wright planes, with their greater lifting power, would go backwards and keep climbing in a strong wind. Honolulu’s imagination was stirred by Hall’s words. 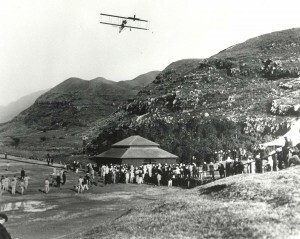 Residents looked forward to the arrival of the men and flying machines. Announcements continued in daily newspapers, plus features on flying. One article was printed which was to have an ironic flavor to it over 30 years later. It related that a dummy battleship was placed at the Philadelphia Fair as a target for airplanes. During the demonstration, flyers dropped eggs and paper sacks filled with flour from their aircraft in attempts to “bomb” the ship from the air. The several Navy officers who watched were quoted as saying Naval craft need never fear the airplane. On December 27, 1910, J. C. “Bud” Mars, pilot for the demonstrations, arrived on the Wilhelmina. Also, aboard the same ship were Captain Thomas Scott Baldwin, the veteran flyer, Tod Shriver, the plane’s designer and also an aviator and two kite-like airplanes. Their strange looking metal birds were taken to Samuel Damon’s Moanalua polo field for assemblage. Each was a pusher craft with propeller and engine behind the pilot; there was no cabin or compartment for the man. One was put in flying order. It was a cumbersome-looking contraption. Where the retinue went, particularly Mars, crowds of awe-stricken and curious people followed. Prior to their arrival, Hall spoke highly of these three men. Captain Baldwin, America’s first airship builder, had contacted airplane pioneer manufacturer Glenn Curtiss (1902) with the idea of installing an engine on his airship, CALIFORNIA ARROW, in the St. Louis Exposition (1904), the first successful controlled, motor-driven circular flight in America. He was a famous balloonist, and well-known for making the first parachute jump in America (1887). Tod Shriver was an enterprising engineer whose ideas for design appealed to Curtiss. He was also qualified as an aviator. Bud Mars had the reputation of being the most daring flyer in the United States. A case was cited to the press of him swooping under the bridges across the Mississippi River. Speaking of Mars’ flying abilities, Hall said the “daredevil” might be willing to take a Honolulu lady in the air, if one dared volunteer. After an expected silence, two days later one not only volunteered but demanded she be taken up by Mars. To prove her lack of fear, she climbed to the fourth floor of the Alexander Young Hotel and teetered on the edge of the parapet. As for the lady passengers, Mars was strong in his denial of any such intention. “No aspiring young ladies or others will be taken up by me in flights over Honolulu. My price for carrying passengers is five hundred dollars a trip, but I would not take any here for that money. The field is too small and the hills rise too abruptly for safety.” He stated that in New York, 32 people rode as his passengers in a two-day period, but they were on short hauls. He stated that another popular flyer, Claude Grahame-White, recently made $4,000 in three days carrying passengers in the East. Hall left the others to the task of putting the plane together for its maiden flight (it was new and was never flown before). The Curtiss agent went to Hilo, Hawaii, to discuss flights on the Big Island. A dispute over guarantees, however, cancelled flight demonstrations there. The services of Honolulu’s Jack Scully and Edwin H. Lewis had been secured for promotion of the flights on Oahu. One of their first acts was to secure the demonstration site. Tickets for Honolulu spectators went on sale at the Empire Theater, the M.A. Gunst cigar store and the Alexander Young Hotel, at one dollar each. One airplane was assembled by December 29th, two days later all was in flight readiness. People arrived on the scene by auto, bus, carriage, drawn by staid old hack horses, bicycles, and afoot. Most of the 3,000 fans that paid admission charges were in full attendance at Moanalua polo field. Hundreds more gathered on surrounding hilltops. Someone counted the vehicles and came up with “200 honk cars,” one of which held deposed Queen Liliuokalani and her friends. The tent hangar was filled with curious people observing the plane’s odd assemblage of spruce, ash, bamboo, steel tubing, and rubberized silk wing covering (an invention of Baldwin). Several feet wider than the ordinary Curtiss biplane, Shiver’s design gave it about 30 feet of wing span, its wings five feet wide and the same distance apart. Soon after 2 p.m., December 31, 1910, the mainland group finished preparations and the slight young man, Mars, climbed aboard the Curtiss P18 biplane. Whipple Hall and the promoters beamed to the large paying crowd, but were dismayed that hundreds more were about to see the same exhibition free of charge from excellent vantage points nearby. The designer, Tod Shriver, stood by patiently. Captain Baldwin was ready to time the event. Crowds held their breaths in suspenseful wonderment, then the engine sputtered and the propeller spun around. The new plane was successfully started. At 2:10 p.m., the marines who guarded the plane moved to one side and the manned box-kite made its way bumpily down the grass “runway.” By Captain Baldwin’s watch, it took Mars nine seconds to get airborne. Thousands of people burst into a yell of approval to see their first airplane flight. They were watching history being made in a feat—unknown to them at the time—which would alter the destiny of Hawaii and, along with other places, the world. Climbing to 500 feet, Mars flew to the hills then back over Moanalua field. Within minutes, he brought the airplane to a standstill on the ground and the crowds gathered in close to see the new hero dismount his iron bird. The test flight was a complete success. Mars met his admirers then lavishly began lauding the airplane and its designer, Shriver. The group then set up a christening ceremony, with the designer’s wife doing the honors. There was no champagne available but someone went to get some by motorcycle. When it arrived, Mrs. Shriver christened the plane “Skylark,” as Mrs. Mars stood by elated at her husband’s performance. Now more relaxed, the young pilot mounted his Skylark and proceeded to make another flight. This time he flew higher and farther. His route was to Red Hill, which commands a superb view of Pearl Harbor and the military plains of Leilehua beyond. A third time, he pleased his promoters by dropping paper souvenirs over Moanalua field. Two lads watched with special interest. 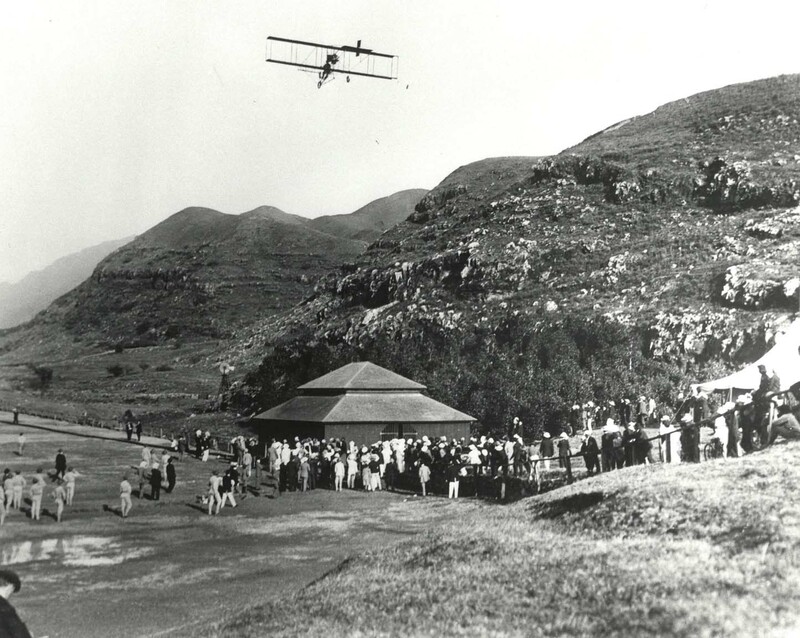 They were the Tuttle brothers, Malcolm and Elbert, who only a short time prior built and flew a glider over the Kaimuki Hills. Also watching, but with a great deal more interest, was Lieutenant Winters who was in the throes of assembling an airplane for flight from Schofield Barracks. He made drawings and took measurements between flights. In his fourth and final flight of the day, Mars climbed to 1,500 feet then proceeded to make turns, dips, glides, and a ”terrific” speed run. After landing, a huge celebration was held in Honolulu. On New Year’s Day, Mars made more flights. This time there was 5,000 paying customers but about 10,000 had side-tracked ticket sellers to take positions on high places overlooking the flying area. The aviator flew a total of four flights, each time battling heavy gusts. At one point, winds forced his plane down to within a few feet of the ground. Later, winds almost caused him to hit the tent pole on the field. Watching the flight activity, one local boy referred to Mars’ airplane as “Pinao,” Hawaiian for dragonfly. Another cried out, “Aloha, Mokulele!” (sky-boat, aircraft). The next day, winds were even more treacherous but Mars made three more flights. Crowds were even larger but once again there were more people on surrounding hills than in the paying section. On his second flight that day, Mars encountered a broken rudder. After making temporary repairs, he took off a third time. But the rudder’s condition and strong winds forced the flyer to cancel his attempt at an altitude record. Mars informed onlookers that had he flown for it he might have been killed. The retinue was disgusted with demonstration profits in Hawaii. They decided to sail for Japan in search of accommodating winds and more paying customers. Although feted as a hero the first few days in Honolulu, Mars left the city a bitter man. He minced no words by calling the non-paying onlookers “pikers” and “deadheads.” Scully, upon recapitulation of expense versus profit, determined the group “just about split even,” after once being $2,000 in arrears. Each exhibition had cost $5,000 but receipts averaged $1,350. The first flight exhibition was over. Man had flown a powered airplane over Hawaii successfully almost 22 years after Joseph Lawrence and his balloon were lost in Keehi Lagoon (November, 1889). It was an unfortunate ending to the advent of airplane flying in Hawaii; one beset with profit motives and name-calling. But the mark had been set. Many more were to follow. Daring Aviator Explores Unknown Regions of the Sky Newspaper article about Bud Mars flight.